If you’ve been hustling Google for the perfect golf laser rangefinder, you’ve probably come across more than a few ideal selections. Further more, during your research, you’ve probably even come across a review or two. Hopefully they’ve been constructive and valuable in helping you make an informed decision before your purchase, but unfortunately they may disappoint and I know why. Are you having trouble understanding what that fancy feature is? Didn’t you just see that same word for a different rangefinder? Are you getting confused with ‘pin this’, ‘pin that’, or something-or-rather? Sometimes, there’s just too much lingo, too much mumbo jumbo to describe the same feature that you just read about on another rangefinder. 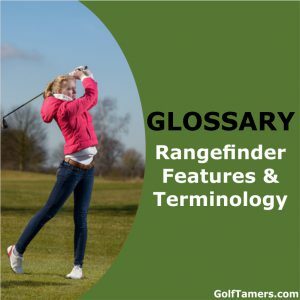 Well, I’m proud to say that you’ve found a one of a kind glossary to whisk you out of the confusing fog of golf rangefinder buzzwords. AccuFlag Mode – This is Laser Link’s name for the primary targeting mode their rangefinder uses. (See also First Target Priority Mode). Advanced PinSensor Technology – This is TecTecTec’s term for a feature which zeros in to the flag and ranges past any overlapping objects that would typically interfere with an accurate reading like the rain. (See also Flag/Pin Seeking Mode). Auto Course Recognition – This is a feature that GPS rangefinders tend to have. By using GPS technology, the rangefinder can automatically identify what course you’re at and provide the appropriate course detail. Auto Hole Advance – This is a feature that GPS rangefinders have that typically goes hand in hand with the Auto Course Recognition feature. By using GPS technology, the rangefinder can automatically identify what hole you’re on and it will provide the appropriate distance. When you’ve made the hole, it will automatically move to the next hole and repeat the process. Distant Target Priority Mode – This mode uses a far-sighted or background targeting technology to acquire the straight line distance of your target. When ranging, it will ignore objects in the foreground and will provide the distance of the furthest target. Digitally eNhanced Accuracy (DNA) – This is Leupold’s tried and true promise to fast target acquisition and precise accuracy. Against all types of backgrounds, they still ensure a 1/10th yard accuracy. Dual Display Technology – Bushnell takes it to the next level by allowing the user to switch between using the LED/Red display or the LCD/Black display at the user’s discretion. Dynamic RangeVue – SkyCaddie has this feature that provides multiple distances with arcs over fairways and greens to aid you in making better club selections. E.S.P.2 Extreme. Speed. Precision. – This is Bushnell’s latest promise to faster target acquisition and precise accuracy than they’ve ever provided before. Any distances within 5-125 yards are all given within 1/10th of a yard to give the player as much confidence as possible that they’ve got the most accurate distance faster than ever. Exchange Technology – On their discontinued Tour X Bushnell used an interchangeable faceplate system that allows you access to their slope compensation technology or the standard, tournament-legal distance-only priority mode when one or the other is installed. Some brands still use this technology, for example Leupold on their GX-4i2. 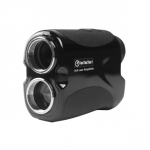 First Target Priority Mode – This is the main mode that golf rangefinders are built with. It uses a near-sighted or foreground targeting technology to acquire the straight line distance of your target. When ranging, it will ignore objects that are in the background and will provide the distance of the closest target. Flag/Pin Seeking Mode – Each manufacturer brand has their own name for this feature. It’s a mode that specifically seeks out and zeros in on the distance to the pin. Sometimes this is just the standard First Target Priority Mode, so you need to carefully read what the manufacturer is advertising. Fog Mode – Leupold is one of few manufacturers that has a specific mode that compensates for weather such as rain, snow, and fog. The laser rangefinder is able to reject reflections off rain drops or snowflakes and still get distances with successful target acquisition. GPS Rangefinders – Global Positioning System (GPS) rangefinders are exactly what you would expect if a map and a measuring device had a baby. A basic rangefinder uses GPS technology to provide golf course detail such as distances to the flag, hazards, and other targets if it has a customizable pin placement feature. Generation 3 PinSensor Technology – This is Breaking 80’s name for the primary targeting mode their rangefinder uses. (See also First Target Priority Mode). Golf Mode/ID Technology – Incline/Decline Technology: This is Nikon’s term for calculating angle compensation values. (See also Slope Compensation). HoleVue SkyCaddie – This feature can be seen in our SkyCaddie review and provides you with an eagle view of the hole you’re playing. HYPER READ Technology – This feature is Nikon’s promise to speedy target acquisition and rapid display of distance readout no matter how far away you are from the target. IntelliGreen – This is SkyCaddie’s graphical picture of the actual green on your course based off your angle of approach. IntelliScan – This is Breaking 80’s term for receiving updated distance readings from objects on the course as you pan. (See also Scan Mode). 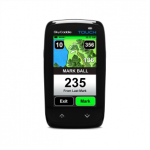 Jolt Technology – This is a vibrating confirmation setting that Bushnell Golf has integrated into their golf rangefinder series. It gives short bursts of vibrations when it’s successfully acquired and locked onto the flag. OLED – Leupold Golf uses an Organic LED/Red display that is a hallmark feature of their rangefinders. PinHunter 2 and Prism Lock – Leupold uses these systems to ensure that the rangefinder locates and locks onto the flag faster than they’ve ever been able to offer before with their same excellent standard of accuracy, giving you confidence that you have the distance to the pin and not anything else. (See also First Target Priority Mode and Flag/Pin Seeking Mode). Pin Mode – This is GolfBuddy’s name for the primary targeting mode their rangefinder uses. (See also First Target Priority Mode). PinSeeker – This is TecTecTec’s name for the primary targeting mode their rangefinder uses. (See also First Target Priority Mode). PinSeeker Mode – This is Bushnell’s name for the primary targeting mode their rangefinder uses. (See also First Target Priority Mode). Rainguard HD – Bushnell treats their optics with a special and patented coating to protect them from fogging up. The lens also easily reject snow, sleet, and rain drops by causing them to break up and scatter when they make contact with the lens. Rain Mode – Bushnell Golf is one of few manufacturers that has a specific mode that compensates for weather such as rain and snow. The laser rangefinder is able to reject reflections off rain drops or snowflakes and still get distances with successful target acquisition. Scan Mode – This mode allows you to scan or pan the course and receive updated distances to targets and objects that come into view while looking through the rangefinder. Slope Compensation – Slope technology calculates the angle and the compensated range to provide an adjusted distance because of elevation changes. Its purpose is to ensure you are properly informed of the distance ahead so you can select the right club to get the proper trajectory to make it to the hole. Slope Mode – This is Bushnell’s term for calculating angle compensation values. (See also Slope Compensation). Smart Key Technology – Leupold uses an interchangeable faceplate system that allows you access to their slope compensation technology or the standard, tournament-legal distance-only priority mode when one or the other is installed. Smart Slope – This is Breaking 80 Golf’s term for calculating angle compensation values. (See also Slope Compensation). Straight Line Distance – This is the horizontal distance from you, or rather the device, to the target you’re seeking a distance from. It’s the primary form of distance that’s acquired with all tournament legal laser and GPS golf rangefinders. True Golf Range (TGR) – This is Leupold’s term for calculating angle compensation values. (See also Slope Compensation). Tru Target Technology – This is a premium Nikon rangefinder feature where you can toggle between First Target Priority Mode and Distant Target Priority Mode using the same rangefinder. (See also First Target Priority Mode and Distant Target Priority Mode). USGA – You’ll see this term a lot while in the market for golf rangefinders. It stands for United States Golf Association. To be able to legally use rangefinders in tournaments, the device must comply with the USGA’s measuring device policy found in Rule 14-3. Vivid Display Technology – This new technology is saved for Bushnell’s premium rangefinders where light transmission, contrast, and clarity are all better than before. The readouts are brighter and the display can be read in any light condition. Zero In Alignment System (ZAS) – Laser Link uses this system with the AccuFlag Mode to ensure that the rangefinder locates the flag with as much accuracy as possible; giving you confidence that you have the distance to the pin and not anything else. (See also Flag/Pin Seeking Mode). Think of this article as the dictionary or the translator to the golf rangefinder industry. Have it as an extra tab while you’re shopping for your next rangefinder. It might help you make sense of all the fancy shmancy words that all mean the same thing in the end.